Detention on the Playism Store | Bringing a different breed of indie game to the world. Set in 1960's Taiwan under martial law. 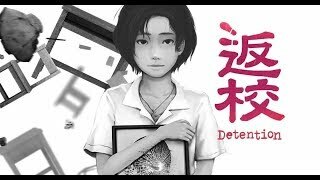 Detention, with unique and appealing graphics and OST. Invites you to unlock the spine-chilling mysteries. For users residing in China, the Steam key is not usable. In such case, please contact us at [email protected] and we will solve the issue for you. Mr.Yao or Coffee as a game designer carried this thought with him for years and in 2013 finally decided to craft a horror game universe filled with Taiwanese/Eastern elements (A mixed of Taoism and Buddhism beliefs with traditional Chinese culture). A year into production, Coffee figured the game’s scale had grown too large, thus approached Light Wang and Henry Wang, who previously created Taiwan’s first greenlit indie title Constant C.
At first glance the two realize that Detention is eye catching and full of Taiwanese flavor. And its uniqueness soon attracts famous composer Weifan Chang, artist Finger, game designer Doy, programmer Chia-Sheng and Vincent joining the team. Together they dedicated to share with world a game that no one has ever seen before. What do you think about Detention? Red Candle Games was founded in September 2015 by six individuals from various backgrounds. At first, the team was united because of one game, Detention, and the goal was to create a game that enable us to illustrate Taiwanese culture and history. As the project progressed, and as more team members started to devote full time to the development, we realized our passion for game making has lead us to the establishment of a game company.